I don’t know about you, but I tend to save my celebrations for the significant moments in life. The big promotion. The new baby. The summer vacation. The sizable financial donation. Big things. Good things. Things that make me want to praise the Lord, sing a song, and maybe even dance the jig (though I’ll admit it’s not pretty). But this morning, the Lord reminded me that every moment on this earth is precious. Every person is a blessing. Every event is momentous. This revelation occurred on my morning prayer walk. As I typically do, I passed by the Swamp Rabbit Cafe, which has a small play area for children. Except in harsh weather, the area is filled with parents and small children, climbing on the various equipment, riding small tricycles, or playing with their toys. Today was no different, but as I walk by, I noticed a little girl playing alone in the corner of the fenced area. At first, I felt bad for the young girl, fearing she was being shunned by the other children and even that she may be crying about her loneliness. But as I drew closer, I realized nothing could be farther from the truth. This sweet child was jumping. Not jumping rope or jumping over obstacles. She wasn’t aiming for a target as far as I could tell. No, she was jumping for the sheer joy of it. Arms pumping as her little legs propelled her into the air. And with every landing, she giggled and shook her blonde curls. Then, she jumped again and again and again—each jump eliciting a joyous response. As I walked, I marveled. This dear child was content. Truly content. She didn’t need toys or equipment or fancy games to bring her happiness. Instead, she found joy in the simple act of jumping. The more I walked, the more I realized how much I long to be like that little girl. I want to find joy in the little things. I want to make a big deal about all the good things in my life. The scale this morning said I'd lost a pound. Let’s celebrate! I received a $20 check in the mail yesterday for a survey I completed. Let the songs break forth. After several days of a very rough detox, I finally feel almost human again. Let’s do the Hokey Pokey (because honestly, that’s the only “dance” I know how to do.) But I think you get my meaning. Why should we wait for the “big things” in life before we praise God or celebrate? Why don’t we recognize the many blessings we’ve been given, both big and small? Yes, as I thought about that precious child this morning, I wondered how much more I would enjoy life if I’d genuinely take time to appreciate it. Every minute. The sun on my face. The breeze through my hair. The colors of the sunset. The loving embrace of my husband. The nuzzles from my precious pooch. The ability to be, walk, and yes, even jump (though it may not be graceful). I’m reminded of the song, “Count Your Blessings,” but even more than that, I’m reminded that it’s more than just a song. It’s an essential ingredient for a joy-filled life. Sure, we can look around and find problems everywhere, but if we’d stop and count our blessings, we’d see they far outnumber the problems. The trouble is, we don’t notice all our blessings—only the “significant” ones. But, friend, that little girl reminded me this morning that every blessing is significant, and none of them should be taken for granted. The Bible has a lot to say about child-like faith, but I think we would all do well, too, to have a child-like appreciation for the little things. We would all be much happier and much more content if we did. 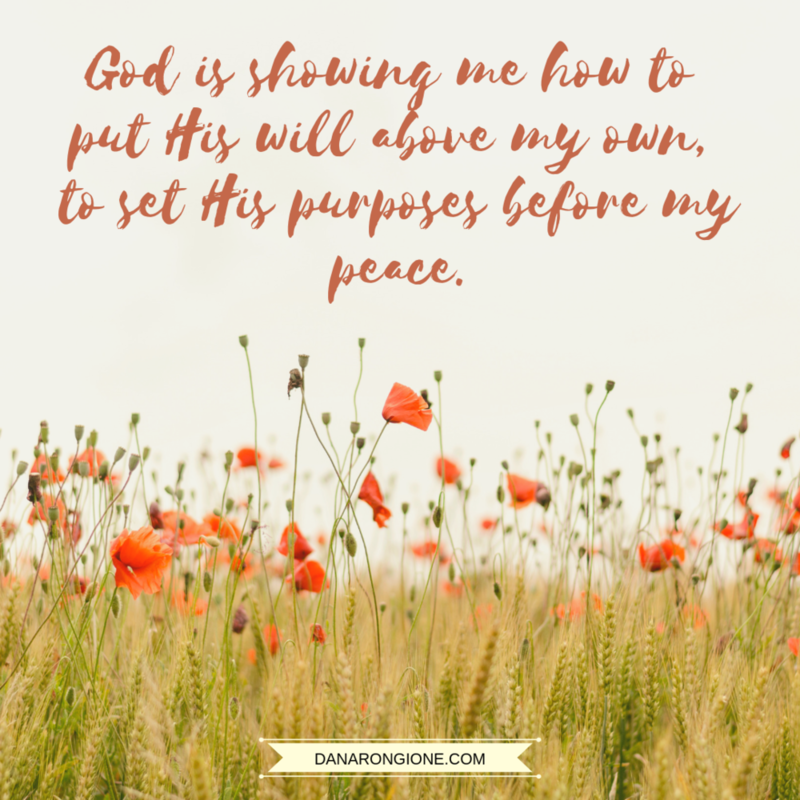 In yesterday’s devotion, I laid my heart bare about my current season of life and how I found peace in learning some new things about having joy in the journey. If you didn’t get the chance to read it, I urge you to do so because, in today’s devotion, I want to pick up where I left off and share with you a couple of other Bible passages the Lord has used to encourage my heart. Let’s begin in the book of Jeremiah. As you can see from this chapter, Baruch had an “I” problem. Woe is me. My grief. My sorrow. I fainted. My sighing. I have no rest. Poor pitiful me! Unfortunately, I hear my own cries and complaints echoing in my ears, so truth be told, I’m no better than Baruch. I’ve been so wrapped up in my personal disappointment and discontentment that I’ve failed to see the needs of those around me. As the Lord put it in the passage above, I’ve been seeking great things for myself. “Who cares about anyone else? So what if people are lost and going to hell? I’m not happy with the way things are going. Poor pitiful me!” I cringe as I type these words. Though these thoughts have not been in the forefront of my mind, they’ve been there nonetheless as has been proven by my actions and my self-consuming prayers. God, forgive me! Before I go any further, let me say I truly believe God wants to bless us. He gives us far, far more than we deserve. But God never promised us a happy life. He never assured us we’d never suffer or feel disappointment or grief. In fact, He promised just the opposite (John 16:33). The point I want to get across is, God is not cruel. Life is hard because we live in a sin-cursed world. It’s not God’s fault. It’s ours. But despite that, God goes above and beyond to provide for our needs and even many of our wants because He’s a good, loving Father. That being said, we saw in yesterday’s devotion how even Jesus became fearful and overwhelmed at the prospect of His crucifixion and all that it entailed. While He was willing to do His Father’s will, He wasn’t exactly happy about the circumstances. It wasn’t a joyful season of life to experience. This is a familiar verse, but don’t overlook the words used to describe Jesus’ emotional state. He endured the cross. He despised the shame. Endured and despised. Boy, can I relate to those words? I’ve been enduring a lot lately—going through the motions of doing what needs to be done and trying my best to do so with a good attitude. And I’ve despised the person I’ve become through this season. Cautious. Critical. Cynical. That’s not me. That’s not who I want to be. But I want you to notice another phrase within that verse: “for the joy that was set before him.” Not the joy He was experiencing by obeying the Father. Not the joy He felt at laying down His life and suffering agony on the cross. Not the joy of being a good Son. It wasn’t a present joy; it was a joy to come. The joy of defeating Death and Hell. The joy of holding up the keys of Hell in victory. The joy of being reunited with His Father. And last, but certainly not least, the joy of living in eternity with us. Unlike Baruch, Jesus wasn’t seeking great things for Himself. He was seeking great things for us. Jesus wasn’t so consumed with His own suffering that He turned His back on others. Instead, He used that love and compassion to keep Him moving forward when everything within His earthly body cried for Him to turn back. He envisioned a brighter day—not for Him, but for us, and that vision gave Him the strength to suffer. Yes, He endured. Yes, He despised. But in the end, He rejoiced, and He will continue to rejoice. Lord, please help me be more like Jesus and less like Baruch. No matter how difficult the season or how weary I become, please help me keep my focus on others and not myself. Let my love and compassion for them drive me to obedience and surrender. And help me remember there is a brighter day coming!